Hello there! Wow, we are in the midst of a deep freeze here in CNY. Today isn't as bad as the weekend though, so I am grateful for that. I think Saturday and Sunday were the coldest we've been all winter long...brrrrr! I did a Spring Craft Fair Saturday and unfortunately there was very little traffic and I'm sure it was because it was so COLD. 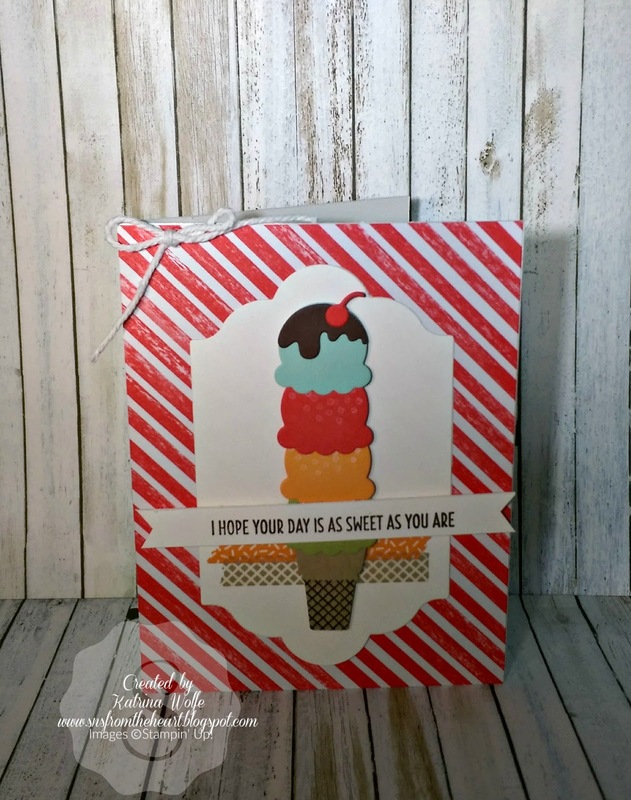 I had so much fun creating this card and I think it will make a great birthday for someone special, especially someone who loves ice cream. Now, who doesn't just love ice cream? Standard Card base of Whisper White 8 1/2" x 5 1/2" scored and folded at 4 1/4". Adhere a piece of the DSP cut 5 1/2" x 4 1/4" to the front. Cut a piece of Whisper White with the larges Lots of Labels framelits and adhere to the front. Stamp a piece of Crumb Cake CS with Early Espresso ink with the "waffle cone" stamp and cut out using the coordinating framelit. Add a couple of strips of Washi. Then cut an ice cream scoop in each of the following colors: Soft Sky, Watermelon Wonder, Peekaboo Peach and Wild Wasabi. Stamp each scoop with the "sprinkles" stamp using the craft white ink and adhere with the ice cream cone to the the card using Dimensionals. Cut the "chocolate" from Early Espresso and the cherry from Watermelon Wonder and adhere. Stamp the sentiment onto a piece of Whisper White, cut 1/2" x 4 1/4" with the Early Espresso ink and banner the ends with your paper snips. Add this to the front of the card using Dimensionals. Add a bow to the top front using the Thick White Bakers Twine and adhere with a glue dot.